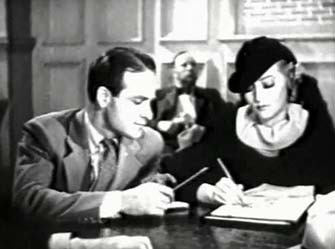 BEYOND A REASONABLE DOUBT with Dana Andrews used the same plot as a 1935 film,CIRCUMSTANTIAL EVIDENCE starring Chick Chandler. 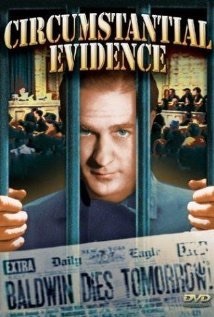 The film opens with Jim Baldwin (Chick Chandler), a reporter, in court for the sentencing of a man who gets the death penalty based on circumstantial evidence. Alongside Jim is Adrienne (Shirley Grey),a court artist for their newspaper. Jim feels strongly that a conviction with no direct evidence should never lead to the death penalty. He persuades his friend Fred (Arthur Vinton),a columnist for their paper,to join him in a scheme which will result in Jim being convicted of murder. They use the fact that both Jim and Fred want to marry Adrienne (though she’s made it clear to Fred that Jim’s the one). They pretend to fight in front of witnesses and Jim starts carrying a gun. On the night Fred is throwing a party at his house, Jim makes sure he is seen at a nearby gas station, then lets one of the party see him looking in one of Fred’s windows. When they all leave,Jim drives up and he and Fred put the plan into action. Fred has a skeleton (only silly part of the film) and Jim puts one of his cufflinks on it. Fred will fire a bullet into the skeleton with Jim’s gun, then set it on fire. Then Fred will disappear to San Francisco. His house going on fire doesn’t seem to bother Fred. I guess he’s insured. But things start to unravel when we see Fred opening his passport and showing an airline ticket for Paris. He has no intention of returning and proving Jim’s innocence ( all because of losing Adrienne to Jim. I know, weak, but Fred’s not the nice guy Jim thinks he is). Just as Fred shoots into the skeleton (Jim has left), another shot rings out and Fred drops dead. Even with a letter signed by Fred,Jim is soon tried and convicted. Adrienne goes to the Governor but he wont relent. The news editor Spike (Lee Moran) finds out Fred has been romancing Mrs. Winters (Dorothy Revier), Her husband Mr.Winters (Claude King) isn’t pleased. Of course Jim gets off and the real murderer is revealed (Take your pick, Mr or Mrs. Winters). It’s a fast 67 minutes, not in the same class as Beyond a Reasonable Doubt, but I enjoyed it, especially since it’s one of Chick Chandler’s very few leading roles. He’s maybe too lightweight as a crusader against capital punishment, but I liked him, and Shirley Grey was good support. There’s also a variation on this theme in 1945’s film of the same name, starring Lloyd Nolan. Wouldn’t mind seeing that. The lineage is slightly more complicated than that. Beyond a Reasonable Doubt was a remake of a 1946 movie called The Man who Dared. It was The Man who Dared that “borrowed” from Circumstantial Evidence. How interesting . Thanks for this. I see from IMDB that George Macready starred. Would love to see it.